Outdoor LED Display Market size was valued at over USD 2.5 billion in 2015, and will grow at over 20% CAGR from 2016 to 2024. Major installation benefits include advanced features such as high definition resolution, brightness, good pixel pitch, energy efficiency, durability and portability. As a result, various corporate brands opt for these solutions to advertise their offerings. 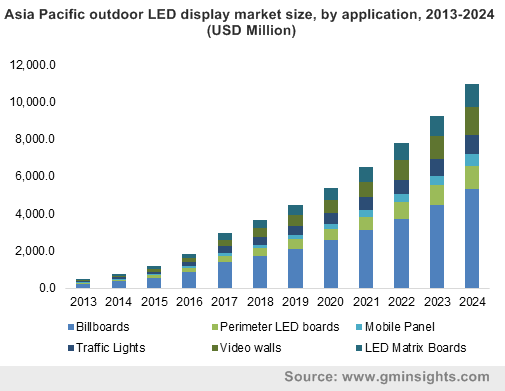 Growing demand for advanced applications such as video walls, advertising boards, scoreboards, stadium screens and perimeter boards is expected to drive outdoor LED display market share over the forecast timeframe. LCD and projector technology present viable product substitutes. However, with constantly changing screen dynamics, lower operating costs, and higher energy efficiency, these devices will continue gaining adoption in sports events and advertising. Growing demand for wireless data connections for billboards, high resolution 10 mm signs that are ideal for high pedestrian traffic zones as well as customizable content are expected to revolutionize growth over the next eight years. Customized content can be programmed and changed based on expected audience, scheduled events, weather conditions and flow of inventory in order to reach the target demographic based on the location. Mobile outdoor advertisement is forecast to play a vital role in this technology. Ads on taxicabs jointed by billboards is expected to provide companies an opportunity to reach their demographic. Phone kiosk advertising, news racks, benches and other customized applications will exhibit high demand. Billboards accounted over 40% of the revenue in 2015 and is estimated to grow at 24.8% CAGR over the next eight years. Growth in the segment can be attributed to numerous features offered such as cost-effectiveness, dynamic content as well as incredible visibility. Traffic lights segment is estimated to grow at over 19% from 2016 to 2024. Initial cost of installation and purchasing digital displays is higher than conventional printed outdoor shows. For instance, LED billboards are rented by minutes with single ad projected for about eight seconds. These ads cost as much as USD 50,000 for two days. The average cost of 3×2 meter variant varies from USD 15,000 to USD 25,000. Growth in digital advertising is predicted to be surged by growing demand for higher manufacture capacity. Technological advancements are expected to result in favorable outdoor LED display market price trend in the coming years. Individually mounted technology segment accounted for over 55% of the outdoor LED display market share in 2015. Increasing demand for large screens with high viewing distance is expected to encourage commercial builders and retailers to adopt this technology. It generates less heat and provides longer life when compared to conventional devices. In addition, it provides brighter illuminated display that is likely to offer greater readability when compared conventional billboards and signs. Surface mounted technology is expected to exhibit considerable growth prospects, and is likely to offer tough competition to individually mounted technology, over the next eight years. Rising adoption of full color models owing to its ability to exhibit high quality videos, animations as well as images will drive full color outdoor LED display market size. Tri-color projection technology is forecast to grow at 22.3% CAGR from 2016 to 2024. This can be attributed to its increasing adoption in digital signage market and scoreboards. Interactive visualization technology displays data using interactive images. Interactive screens are expected to be deployed at various public places such as train stations and bus stops over the forecast period. Rising trend towards interactive media with 3D format support may positively impact growth. For instance, in 2010, Sony developed a HD 3D system measuring 1,136 square feet. It is made of 345 tiles and each tile is made up of 9 squares with a viewing angle of 120 degrees. Asia Pacific outdoor LED display market size was valued at over USD 1 billion in 2015. It is predicted to grow at nearly 25% CAGR from 2016 to 2024, owing to growing number of sports activities along with infrastructural development across emerging nations such as India and China. U.S. outdoor LED display market share accounted for more than 50% of the regional revenue in 2015 and is likely to be valued over USD 2.5 billion by 2024. Growth in the region can be dedicated to rising demand for customized solutions along with increasing technology usage in numerous prominent streets including New York, Times square and The Boardwalk in Atlantic City. Interactive floor displays specifically designed for the commercial entertainment sector is also expected to witness considerable demand. These floors are available for theme parks, malls, hotels, sports halls etc. For example, Gulf mall of Qatar has 3D interactive flooring with special effects and product advertisement on digital signs. Key players include LG Electronics, Sony, Panasonic, Toshiba, Daktronics, Shenzhen Dicolor and Electronic Displays. Other prominent industry participants include Barco NV, Optoelectronics, Leyard Optoelectronic, and Lighthouse Technologies. Product life improvisation along with capacity increment are few strategic initiatives adopted by industry players in order to gain competitive advantage. Furthermore, vendors operating in the industry are likely to offer end-to-end solutions, from manufacturing to installation at the site along with after-sales services. Industry participants focus on R&D investment in order to increase efficiency and reduce emissions as well as losses is forecast to describe industry scenario over the forecast period. Key players are expected to cut down operating expenses by allowing advertising companies to update displays via automation rather than regular and labor intensive on-site visits. The outdoor LED display market supply chain includes raw material/component suppliers, manufacturers, distributors/sales team, and end-use areas. Raw materials used in manufacturing include data collectors, back covers, driver chips, PCBs, LED lights, cabinets, and LED tiles. The industry comprises a large number of raw material providers include Osram Opto Semiconductors, Abacus LED, Epistar Corp., Aixtron AG, Universal Display Corporation, and Lighthouse Technologies Ltd.